Turns out, you don’t want to get on Facebook’s bad side, or so TBG Digital has learned. According to InsideFacebook, the social media advertising company had its Facebook Preferred Marketing Developer program badge revoked for reasons yet unknown. However, Simon Mansell, TBG Digital’s CEO suggests that his company violated the rule for discussing new product tests. Facebook fiercely guards its new features from public view, although it’s nearly impossible to keep everything out of our prying hands. It’s nearly inevitable that during testing, word slips about new products. But it appears that this time, Facebook will promptly exercise its right to dismiss partners — in this case, a member that was a part of Facebook’s Preferred Developer Program. The Preferred Developer Program awards badges to Facebook accredited developers, and these badges are separated into four different qualification areas: Pages, Ads, Apps and Insights. Earlier this year, Facebook’s PMD program launched a new, exclusive level called “Strategic PMDs” with 12 launch partners including Saleforce, SocialCode, Adobe, and others. To have a shot at joining the ranks of the Strategic PMDs – they’re typically the first to gain first access to Facebook’s alpha and beta tests – a developer must be an existing PMD developer. Having been revoked of its PMD badge, TBG Digital says it now won’t qualify for this coveted early access to new advertising features or revenue opportunities for example. If indeed TBG has broken this rule, Facebook’s has the right to terminate its permission to use the badge “at its sole discretion.” But the company insists that its business hasn’t been directly affected by the suspension since it still has access to Facebook’s API. As for regaining its privileges to use the PMD badge, TBG Digital is working on it. 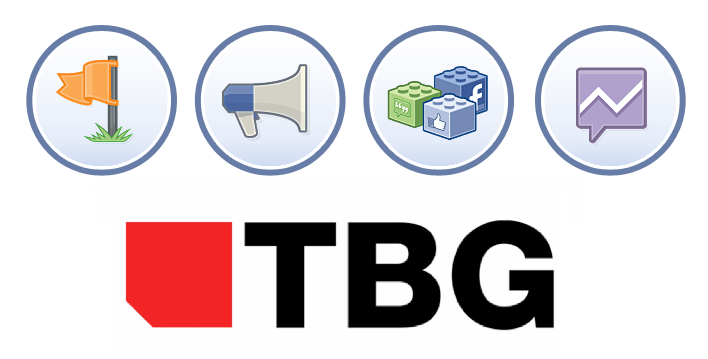 The remaining question: What exactly does Facebook suspect TBG Digital of discussing pre-launch?